Have you ever had an evening where you really, really needed (and you're going to have to excuse me the cliché) to feel the love - and you actually got what you needed? That's what my umptieth birthday party was like on Saturday night. It was the sort of evening where you wrap yourself in a delicious warmth, a sense of being surrounded by dear family who are also true friends, and true friends (some of whom you've known, as you might say, "since before we were born") who feel like -- and really are, in the best sense -- family. Pics are lacking at the moment, since I didn't bring a camera, and those that others took are still forthcoming. Above is a plate that blurrily shows some of the spoils that my darling cousin Diane (in whose home we were) and I were left fighting over at the end of the evening. Among the five(!) desserts, the only reason the fabulous Trianon cake and the stupendous chocolate gingerbread were left is because the makers (equally fabulous Bakerina and completely stupendous Bunni) made two each of those. So alas, there's no chocolate raspberry cake or pistachio nougat cream cake or Lemon Hoo-Ha! (and yes, Lemon Hoo-Ha! Therein lies a tale and a recipe for another time) left to show you. ...because, well, not all of it, but almost all of it got eaten up. While I was cooking and prepping all of this, I felt somewhat despondent, thinking that I'd waaay overdone it with the food, and that we would all be swamped with too many leftovers. Not so. The crowd of musicians and visual artists, helping professionals, theater folks, educators, science/medicine professionals, lawyers, non-profiteers, and writers descended like locusts. Fortified by Scott Peacock's champagne punch as well as lots of our favorite red and some of our favorite white that we'd laid in, they demolished the platters. The theme was clearly *eclectic mix* both in the food and the folks. My darling husband provided a fab music mix, and everyone ate, drank, talked, mingled, laughed uproariously, found six or many less degrees of separation (some quite amazing connections, actually), made new friends, and stayed late. We finally left in the exuberant state of happy exhaustion that comes of a successful party, and the knowledge that whatever else life may bring, uh-huh, the love is there, whenever you have a chance to put it all together. "Where would you like to go for your birthday?" asked my best beloved. I wasn't sure it mattered too much; I just wanted to be with him. We had some pretty fancy meals coming up anyway -- a soirée this weekend; a dinner invitation next month to a rather special venue. But I gave his question some thought. A friend of a friend made a superhuman effort and got us a reservation at Babbo. The best she could do was six days *before* my birthday. Apparently all the days around Valentine's Day (my birthday is three days after) were booked up at Babbo; consolation prizes for the sweeties who couldn't get in on the lovers' day itself, I suppose. I decided that we'd put the Babbo plans on hold, and see if we couldn't call this marker in for another occasion. We go out pretty rarely, and I thought I'd rather have a rest from kitchen duty on the actual birthday, as it were. So I settled on having the celebratory meal at Telepan. I've wanted to try this restaurant for a while, but a couple of factors were the deciding ones. First, it wasn't so over the top that we were going to a) break the bank or b) have to dress up, which I don't mind but which G equates with various sorts of torture. Secondly, it has a tasting menu -- but one you put together yourself from their various courses. Now me, I'm an intrepid eater that loves a tasting menu -- lots of new treats to savor. G, on the other hand, is the sort of eater who, when faced with various arty constructions on his plate, is wont to say things like, "Are there mushrooms in this?" It's hard to let the chef cook for you when you're with dining companions who have a lot of uh-ohs on their list of acceptable food substances. So a four-course tasting menu where you choose all your courses satisfies us both. We went to an early showing of Persepolis (a bit disappointing, but I won't spoil it for you). Then we walked up Columbus in a misty, romantic rain. 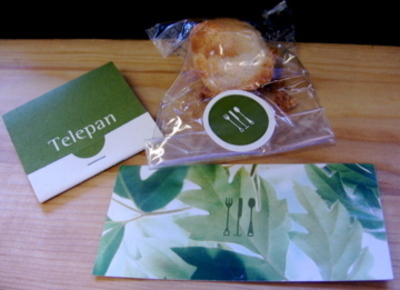 Telepan is a pretty space, with friendly service. Despite a bit of crowding at the entrance, we were seated promptly for our reservation. Shortly thereafter a server offered us a choice of warm breads (we both chose the semolina raisin fennel). Then another server showed up with a pretty wooden trencher of amuses bouches for each of us. Lined up in a row was a little gougère, a porcelain spoon of salad, and the obligatory demitasse cup of soup (although I did bring my camera to this meal, we were in a very low-lit part of the room, and not a single one is unblurred -- which is sad, since the food was very pretty. The composition of souvenirs above was, of course, taken after the fact). The cheese puff was a surprise -- it was filled with a sharp, molten hot cheese sauce. The salad was finely shredded brussels sprouts in a citrus vinaigrette with ricotta salata cheese, which turned out to be a very fine combination. The soup was parsnip with pineapple -- again, nothing I'd ever think of throwing together, necessarily, but quite lovely as it turned out. These preliminary tastes boded well for the meal to come, I thought. I loved my first course -- tiny grilled quail on a salad of fresh greens, roast duck meat, oranges and chunks of toasted almond. Tasting menu portions are smaller than ala carte, of course, but the little half quail was sufficient for me, since I always have to pace myself with a multi-course meal. G was not as happy with his starter. He had chosen a salad with a dry jack cheese dressing, which turned out to be composed of very tall reddish salad leaves. I tasted it, and could see why he was unimpressed. The salad dressing was not balanced -- it was very vinegar-forward, to the point of concealing the flavor of the cheese -- the very thing designed to tick off my cheese-loving husband. Both of our mid-courses, however, were exceptional. We both had pastas -- I the lobster bolognese, and he the veal ravioli. The bolognese was a gorgeous big chunk of lobster tail in the shell, balanced atop a tangle of spaghetti in a very light, herbal tomato broth with more lobster chunkettes. I wanted to lick my plate, but refrained. G's was light, pillowy ravioli filled with shredded roast veal, and sauced with a pure veal jus reduction. Very simple -- and very, very good. Things fell down a little during entrée time. G's hangar steak was tender and delicious, but he looked askance at the two little slices on his plate. This is where the tasting menu concept doesn't work for him -- he waits through the meal for the thing he likes best, and then it's a little dollhouse portion. The roast loin of veal, my choice, was only one slice, which was actually plenty for me. Unfortunately, it was on the very rare side of medium rare, which is a nice thing when it's steak, but not so much when it's veal, in my opinion. Veal is one of those meats which, when it's too rare, becomes (in the words of the immortal Laurie Colwin) a tough matting of wet red fibers. I didn't send it back, however, because that always creates problems in a multi-course meal. I soldiered through several bites of it, and very much enjoyed the accompanying geometrically perfect block of crunchy exteriored/creamy interiored potato slices, and the little clump of pungent black kale. A few tables down from us, a silver-haired dowager did indeed send back her veal, and then the not-so-much-fun started. Of course her three other dining companions finished their tiny entrées in a trice. By the time the server came by to assure her that her veal would be right out, she was in a full-blown snit. "Never mind," she said haughtily. "Can I get you something else?" "Can we have it packed for you?" "NO," said she. "I said, NEVER MIND." By this time, the server had gotten the sous manager, and the sous manager had gotten the manager-manager...but it was no use. The queen mother would not be mollified. The server came back. "The manager wants you to know that he would like to treat the table to dessert." "I thought the dessert came with the meal anyway," replied the woman, razoring right through the waiter's gesture. The poor fellow had just about reached wits' end, but made a superhuman effort to respond without throttling her. "Yes, of course, but the bill will be adjusted to reflect complimentary desserts," he said, just the tiniest hint of exasperation filtering through, perhaps only noticeable to me. Ah, the theatre of dining out. I tend to forget about other people, since we mostly dine á deux. We were busy with our own not-complimentary but still very nice (full-size!) desserts when I began to pick up conversation from the other side. At the four-top to our right was a pregnant couple and an engaged couple. There was talk of bachelor parties and baby showers. G appeared not to notice, engrossed as he was in forking up warm ginger cake, pear fritter, crème fraîche ice cream, poached pear and cranberries. The daddy-to-be at our neighbors' table excused himself and left for a bit. The engaged couple honed in on the mommy-to-be. "How are you feeling?" they asked. "Mmmm, I'm not ready," she said. "Not ready for this at all." "Ummm," said the engaged guy. "Then, ummm, why are you doing it?" Soon-to-be-mommy smiled and shrugged. "Well, you know," she said. "It's what people do." I took my spoon from my crumbly, fudgy, chocolate pecan tart, and dipped it, first into the quenelle of caramel crumble ice-cream on the side of the plate, then into the long stripe of dark fudge, then into the little pool of rich warm caramel. The daddy-to-be came back to the table, and their conversation shifted. I looked up from my luscious plate of sweets, and caught G's eye. He had indeed been listening. "I'm so glad I married you, and only you," I said, as the waiter brought the check with some tiny citrus-scented coconut macaroons in little wrappers. "And I you, my love," said G. "And I you." Miss Austen's words are certainly a truism in our household. Long gone are the days when I suffered pie anxiety, thanks to good dessert gurus like David Lebovitz and Rose Levy Beranbaum. 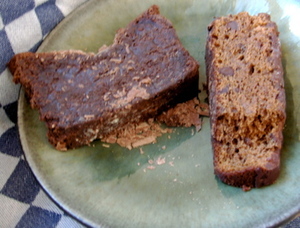 But it was this recipe that put my tough-crust terrors to bed once and for all. Like others, I'm not always a die-hard fan of the philosophies espoused in Cook's Illustrated (like any good rebel, I actually continue to eat green beans despite Chris Kimball's hatred of them). However, sometimes the folks at CI really do hit the mark, like the time some clever cook thought of using vodka in the pie-crust. Plenty has been written about this already. People have experienced varying degrees of success. All I can tell you is that I have yet to come out with an imperfect crust using this recipe, especially when combined with Rose Levy Beranbaum's baking techniques for two-crust pies filled with juicy fruit -- like apples. It's a stand-up crust -- flaky, buttery, flavorful as a dream, but refusing to become sodden under the weight of pounds of juicy fruit. 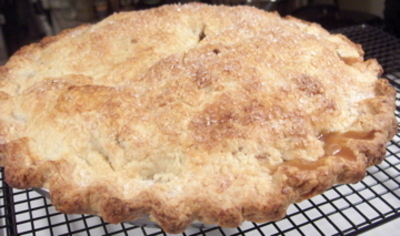 If you read this blog with any regularity, you probably know of G's penchant for apple desserts. So it is our tradition that on Valentine's Day, instead of the chocolate fondue or chocolate soufflé or molten chocolate cake that everyone else is whipping up for their sweetie, I make apple desserts. And G makes sure that my chocolate jones is met with a lovely big box of dark, delicious sweeties from this place. Usually I bake a killer crumble, or apple toffee bars, or maybe a heart-shaped apple upside-down cake. But not this year. Several months ago, at Thanksgiving to be precise, I eschewed my usual dolled-up apple-toffee caramelized crunchy crumble-topped pie that I've made for the past few years. 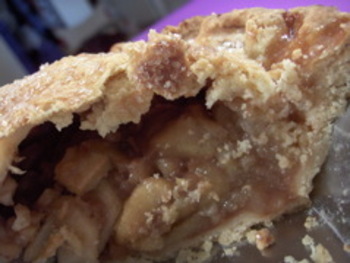 My father, whose advanced age means that he must be obeyed, had asked for a traditional two-crust apple pie. With a little help from the vodka bottle and another secret weapon, the cider jelly jar (and this must be a jelly made from absolutely nothing except pure apple cider), I made what my husband immediately dubbed the "Best. Apple. Pie. Ever." It was so good that I made another one, since we were expecting company for a belated Thanksgiving just a few days later. Company didn't come, and we had the second pie all to ourselves. Most of the time he doesn't ask for much, that G, and tends to be pretty content with wolfing down whatever I come up with for dinner, most days -- as well as cleaning up the disaster-area of a kitchen I often leave in my wake. But every so often, he slyly mentions the possibility of my making another apple pie. So this year, I knew what I would bake for my sweetheart, Hallmark holiday or no. 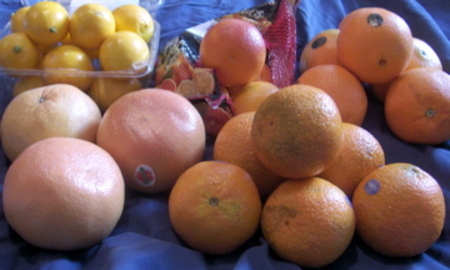 It's going to be a while before those of us in the Northeast see fresh, seasonal, local fruit. But even apples that have been in storage for a few months respond well to this treatment. Give this lovely treat a whirl, and your longing for other fruit a rest for the moment. And you needn't even wait for a holiday. Remove the dough for the bottom crust from the refrigerator. If necessary, allow it to sit for about 10 minutes or until it is soft enough to roll. On a floured pastry cloth or between two sheets of lightly floured plastic wrap, roll the bottom crust 1/8-inch thick or less and 12 inches in diameter. Transfer it to a 9 or 10-inch pie pan (I use a 10-inch; this is plenty of crust, but you will need at least 3 lbs of apples). Trim the edge almost even with the edge of the pan. Cover it with plastic wrap and refrigerate it for a minimum of 30 minutes and a maximum of 3 hours. In a large bowl, combine the apples, lemon juice and zest, sugar, maple syrup, cinnamon, nutmeg, and salt and toss to mix. Allow the apples to macerate at room temperature for a minimum of 30 minutes and a maximum of 3 hours. In a small saucepan, over medium-high heat, boil down this liquid, with the butter and the cider jelly, to about 1/3 cup (a little more if you started with more than 1/2 cup of liquid), or until syrupy and lightly caramelized. Swirl the liquid but do not stir it. Meanwhile, transfer the apples to a bowl and toss them with the cornstarch until all traces of it have disappeared. Roll out the top crust large enough to cut a 12-inch circle. Transfer the apple mixture to the pie shell. Moisten the border of the bottom crust by brushing it lightly with water and place the top crust over the fruit. Tuck the overhang under the bottom crust border and press down all around the top to seal it. Crimp the border using a fork or your fingers and make about 5 evenly spaced 2-inch slashes starting about 1 inch from the center and radiating toward the edge (yesterday I cut a heart-shaped steam vent instead). Cover the pie loosely with plastic wrap and refrigerate it for 1 hour before baking to chill and relax the pastry. This will maintain flakiness and help to keep the crust from shrinking. Preheat the oven to 425 degrees at least 20 minutes before baking. Set an oven rack at the lowest level and place a baking stone or baking sheet on it before preheating. Place a large piece of greased foil on top to catch any juices. Brush the top of the chilled pie lightly with cream, and sprinkle with crystal sugar. Set the pie directly on the foil-topped baking stone and bake for 45 to 55 minutes or until the juices bubble through the slashes and the apples feel tender but not mushy when a cake tester or small sharp knife is inserted through a slash. After 30 minutes, protect the edges from overbrowning by covering them with a foil ring (I generally need to keep most of the top of the pie covered for a good portion of the baking time, but that may just be the vagaries of my extremely poor oven). Cool the pie on a rack for at least 4 hours (ha!) before cutting. Serve warm or at room temperature. Store at room temperature, uncovered. Reheat any leftovers gently before serving to crisp the crust. Better late than never, as they say. Just for fun, and because I'm really not in the mood to read the textbook for my Public Policy Analysis class tonight, I'm procrastinating by entering Culinate's Death By Chocolate contest. Here's the post I submitted. There are lots of wonderful entries, but should you feel moved to do so, please register and vote for me here. A birthdayish trip to the Napa Valley would be pretty wonderful, methinks. In the middle of the pathway of life, I found myself in a dark wood, on a lost road. Welcome to Steak 'n' Shake. May I take your order? Good readers, once again, it has not been my intention to abandon you. But recent events (which, quite honestly, don't bear explanation) have been so completely overwhelming that I have had neither time, energy nor inclination for blogging -- and this in the sabbatical year when I was hoping to blog a great deal and do some other kinds of writing as well. It should have been my year to just write my little heart out (and go to the gym, and help G with his business, and do a million other things that I don't seem to get to). I think it suffices to say no more than that I've been having some personal problems which have required pretty much all my attention. On top of this all-consuming difficulty, we have had a string of deaths. There were three, so if life does operate by the venerable rule of threes, we should be all right for a while -- at least as far as that kind of loss (I have discovered, to my sorrow, that there are losses that cause you to feel as grief-stricken as an actual death, even if or perhaps particularly if the one you've lost is still walking the planet. But at least in the latter case, the possibility of recovering from such a loss, and perhaps recovering the person you feel you've lost still exists...). A friend of a very close friend, whom we knew quite well, passed away suddenly at the New Year. The cousin of an in-law, whom we didn't know at all, passed away, requiring the postponement of important business. And G's gramma, who had been for some years in a nursing home, unable to recognize her near ones and dear ones, also passed away. This too meant that much had to be postponed, as we had to fly out to Indiana for the funeral. And rather than any of my other recent stories, that is the tale I will tell you here. While searching for the cheapest possible plane tickets (yes, dear friends, we flew to Indianapolis via Atlanta, if that makes any sense), I realized that I was about to meet an entire, unknown branch of my new family. G's dad's relatives, once from Indiana, now live in Tennessee and Kentucky and Minnesota, and were not able to make it to our family wedding party last May. So I scurried around my closet searching for appropriate funeral clothes. "Everything's hopelessly out of style," I moaned. "Sweetheart." G spoke firmly. "We're going to Lebanon, Indiana. There is nothing you could wear that wouldn't shout 'New Yorker' at everyone. They will think everything you have is wonderful, and try to find out where they can get one." G had spoken to the heart of the issue. We were going to the midwest. He knows that I have a tendency to romanticize the heartland. It's true, I do like to think of it as a place where rosy-cheeked farm wives bake fresh hot huckleberry pies while their husbands are out working the combine (not that I actually know what a combine is). Every now and then, G gently tries to help me understand that the farms have been sold to big bizzness and the farm wives have ditched their hand-stitched aprons for the pastel poly pantsuits they wear on their shopping trips to WalMart. After a couple of grueling flights, a long wait for baggage, and confusion at the car rental counter, we arrived at the (dis)Comfort Inn at about 1:00 a.m. Our travel odyssey was mitigated only slightly by the immediate presence of a Steak 'n' Shake right outside the airport. 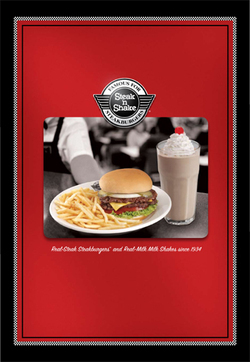 G has long sworn that we would make our fortunes if only we could get hold of a franchise to open a Steak 'n' Shake in Times Square. Sort of a cross between fast food and a diner, Steak 'n' Shake's steakburgers and milkshakes are actually made of real food, rather than polyvinyl chloride, and taste accordingly. They also operate 24/7, which is all to explain why we were having milkshakes and fries (and in G's case, a steakburger) at midnight. Because it was there. Since there's no longer a family homestead in Indiana, our options for breakfast before a long morning of viewing, funeral service and unmet relatives were limited. Sadly there were no farmwives anywhere offering to make us a hot homemade breakfast, so we were relegated to the tender mercies of Denny's, the threshold of which I've never crossed before -- partly because I simply don't eat fast food and partly for political/historical reasons. However, it was the closest option, and we were on a tight schedule. I will never eat at Denny's again, that much I can tell you. They may have come a long way toward eradicating the discriminatory policies that have plagued them for more than a decade, but there is simply no justification for a restaurant that encourages you to waste as much food as possible -- whether the waste means leaving it on your plate or simply eating far, far more than you need. When G tried to order just eggs, the waitress told him that not only were the hash browns free with the full breakfast, but that if he ordered just the eggs as a side, it would cost him 20 cents MORE than if he ordered the full breakfast. When I tried to figure out how to order some eggs with just bacon OR sausage, rather than both, I discovered that it would cost $2.00 MORE than ordering one of their obscenely large breakfasts with several breakfast meats. This bothered me so much that I haven't been able to let go of it. This corporation is basically insisting, through economic persuasion, that people either overeat grossly or throw away food. No, I will never eat there again, unless those policies change radically as well. G was right about my fashion statement, of course. I bonded with a cousin-in-law since we are both of the tribe of public educators. I was very much in keeping with the clothing of the day, since all the women seemed to be wearing long black wool skirts. My brocaded pashmina and my geode ring, however, came in for a great deal of admiration. God was very much in attendance at Gramma's funeral service. For an ethnically Jewish/pagan/agnostic/I'll- find-my-own-spirituality-somewhere-or-other-urbanite, I've attended a fair amount of church, including my own niece and nephew's recent baptism at Park Avenue's posh R.C. outpost, St. Ignatius Loyola. But the services are always so ecumenical. There's lots of stuff about love and all, but only infrequent, tasteful mentions of God. Not so with the Presbyterian service in Lebanon. There were plenty of direct Bible quotations, psalms, prayer, and exhortations to reflect upon your own relationship with God the Father. It was kind of refreshing, actually. And it was truly an example of community in action. Gramma had not lived in this town for more than four years, but she had a very nice turn-out. People from the church and from other parts of the community remembered her and came to the service. Afterward, the good ladies of the church served lunch to the family and friends of the bereaved. Again, something that someone like me only really knows from reading about it in books. As I somehow or other knew and predicted to G, we were served that midwestern favorite, hotdish. This particular exemplar included chicken, celery, rice, cheese, water chestnuts, and large quantities of canned cream soup. The water chestnuts came in for much favorable commentary at the lunch table. Later, in the car, G and I tried to deconstruct the dish a little more. "I think it was mostly cream-of-something soup," I said. "I think it was cream-of-cream soup," said G. "It might have been cream-of-soup soup," I replied. Finally we agreed that it had probably been cream-of-can soup. But we were still in for the trip's culinary highlight -- something really and truly good. For years, G had told me that one of the only things he really liked to eat in Indiana was the fried catfish at a place called Stookey's, in a town called Thorntown. Since we had another night at the Comfort(less) Inn, with its excruciating excuse for beds, we needed a dinner option. So, together with G's parents (all other family had left town already), we drove out to Thorntown, to see if the myth (for me) and the memory (for them) of the fried catfish held true. Stookey's bills itself as "family dining", and this is very much the case. A place of old-timey etched-logo windows and old-fashioned steakhouse seating, the waitresses check in with you every few minutes, and will not rest until they can refill your iced tea. Salads and sides are pretty standard, although their vinegar-based coleslaw, which I did not try, is apparently famous. So too their onion rings, of which we had an appetizer order. Hot and crisp and homemade, they were some of the best I've had in recent memory. 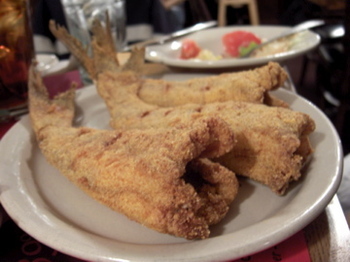 But what you come to Stookey's for is the catfish. I was slightly taken aback to have a couple of entire fried fish, bones and tails and all, set down in front of me (above you can see G's plate of three fishies; mine was a two-plate). I suppose I'm used to getting filets when I order fried fish. G's mom coached me. "You have to kind of scrape it from the backbone, and then turn it over." This technique yielded mouthfuls of the sweetest meat and the crunchiest cornmeal breading I've ever tasted, and left neat skeletons on my plate. Worth a trip to Indiana, hopefully for happier reasons than ours. So -- home again, home again, more awful, turbulent, storm-tossed flights (I've told you before how much I hate Delta, haven't I? And in addition to all their other sins, the only food they give you on the plane is the world's most miniscule, dollhouse-sized packet of approximately seven tiny, substandardly small peanuts. It made me long for Jet Blue, and a packet of blue chips or Dorito mix). But someday soon, there will be better news to report, lifewise as well as foodwise. I have a birthday coming up in a few weeks, one of those numbers which is either the new twenty or the new thirty, can't decide which. And G and I are going to throw me a splendid party, with the help of a most darling and beloved cousin who's loaning out her spacious and lovely home. Maybe you'll help me figure out some of the delicious things I'm going to cook (hint -- I'm putting together a menu of lots of platters of tapas-style food, enough to constitute dinner, no need for main courses. We've figured out wines, but I want a nice fun fruity cocktail to serve. Any ideas for food or drink welcome). I've got sweet friends who are also accomplished bakers/cooks offering to make cakes and other goodies. And we've got a great music mix, so maybe we'll even have dancing. Despite being at the midpoint of life, lost in a dark wood, we're going to have fun, dammit.